VoIP – Why Is It So Lucrative For Small And Medium Businesses? There seems to be a lot of hype surrounding VoIP (Voice over Internet Protocol) and unified communications. VoIP service providers call it the best thing to happen to small businesses but seriously, how advantageous is it to SMBs (small and medium businesses)? A recent report by Software Advice – an online resource for business software reviews – where more than 350 mid-level businesses were surveyed (the respondents made less than $180 million or £120 a year), revealed reasons why mid-cards feel integration of VoIP to be daunting. 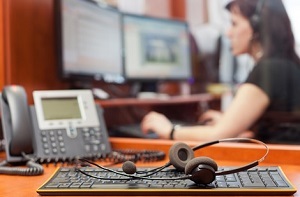 More than 50 percent of the buyers were new to VoIP. A big chunk of the sample wanted hosted solution. Times are Changing, So are the Traditions. Businesses are now looking to shift to VoIP. 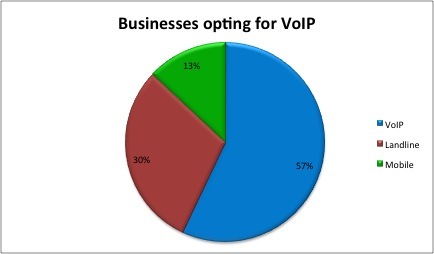 Nearly 57 percent of respondents were interested in investing in VoIP. Nearly 30 percent of businesses were using landlines while only 13 percent were reliant on mobile phones for communication. Businesses Need Reliable and Scalable Services. Nearly 17 percent were not happy with the reliability they are being offered and complained about connectivity and dropping issues. Around 15 percent said they were operating ar max capacity and need more lines to expand. Buyers Need Greater Mileage for Invested Money. Value for money was among the key reasons why people are looking to switch to VoIP. 15 percent said they need cheaper alternative while 14 percent responded they needed more features. Added support and user-friendliness were also among important factors that compel buyers. Surprisingly, not many were concerned about quality of calls (only 10 percent). Cloud-Based is Most Preferred by Small Businesses. The research revealed high correlation between reliability and hosted solution. Most of the small businesses preferred web-based or hosted solutions, denying IP-PBX. The remainder did not specify. An interesting finding from this data was that small businesses actually lacked a proper IT team and preferred web-based solution primarily because of the ease of management. PBX and Auto Attendant are like Hotcakes. Every business surveyed out of the sample of 350, inferred a demand of PBX from their system. Those who didn’t mention PBX by name inferred it. Auto attended showed a remarkable demand among buyers, primarily because of its perks. One of the respondents said she could use an auto attendant because it gives the impressions that her business is big. Conferencing and Faxing were also among the most desired apps beating ACD and CTI (auto call distribution and computer telephony integration). The reason for this could be that only 10 percent of the sample represented call centers which have need for ACD. Voicemail turned out to be the most demanded feature (more than 27 percent) followed by caller ID (9 percent), voicemail-email (7 percent) and number portability (7 percent). Even though a portion of SMBs still prefer good old communication methods, the numbers clearly show that the majority is shifting towards VoIP. Businesses demand reliability, scalability, user-friendliness and convenience – all that at the best possible price. VoIP has the power of numbers on its side. It will be worth watching how many of those 43-44 percent of businesses turn to VoIP in the future. This Article is provided by VoIPInvite – An efficient and fast VoIP network through next generation Wholesale SIP/VoIP Dialer termination services and automated dialer hosted call center software with dedicated bandwidth.